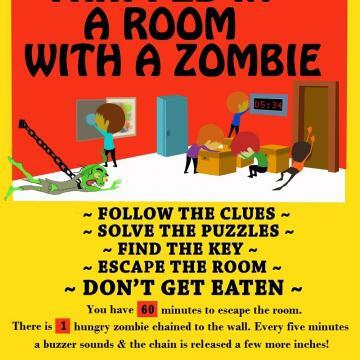 Prepare to be locked in a room with up to 11 other people and a Zombie that is chained to the wall! Hidden in the room is a key that will unlock the door to your freedom. To find the key you must locate numerous clues and solve riddles. 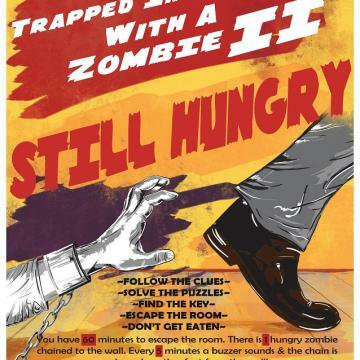 Every five minutes the hungry Zombie?s chain will be released another foot. Within an hour, the Zombie will be able to reach you. 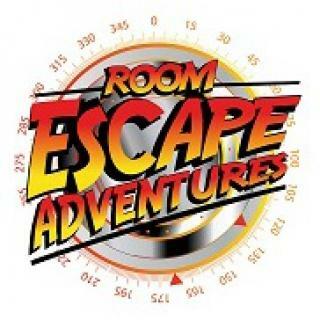 You have 60 minutes to the find clues, solve the puzzles, unlock the door and escape the room without getting eaten! Are you smarter than a Zombie? Find out!